Round bore w/keyway (English). 1" bore, 1/4" (6.350mm) keyway, 3/8"- 16 set screw. Bore ShapeRound. Irrigation-Mart 800 SAY-RAIN. WYT3-11-2-34 Male tube yoke. Male tube yoke. Weasler reference number 300-7334. Bore ShapeLemon. Alternate numbers AW040540A, A-W040540-A, 658-80130. 1-1/2" square bore with set screw. Fits Case-IH and John Deere applications. We will do our best to locate the parts you need, and make every effort to save you money. 804-3524 DRIVE-LINE. Driveline > Yokes. Tractor yoke. 1-1/4" round bore, 1/4" keyway and 5/16" with set screw. Up to 15 HP (540 RPM) or 22 HP (1000 RPM). Weasler reference number 806-0620. Tisco Parts. Male tube yoke. Bore ShapeTri-lobe. Tisco Parts. Male tube yoke. Bore ShapeLemon. Tisco Parts. 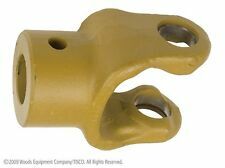 AC Delco Drive Shaft Yoke for PTO shaft. 1-1/2" shaft with shear pin. 1" round bore, 1/4" keyway with set screw. Up to 17 HP (540 RPM) or 26 HP (1000 RPM). Weasler reference number 800-1216. DRIVE SHAFT: Series 12, 1" square bore. OEM numbers 12N184, 12N184GV, 8001218GV, 800-1218GV. 1-1/8" round bore, 1/4" keyway with set screw. Up to 17 HP (540 RPM) or 26 HP (1000 RPM). Weasler reference number 800-1218. 1-1/4" bore, 1/4" (6.350mm) keyway, 3/8" - 16 set screw. Irrigation-Mart 800 SAY-RAIN. Tractor yoke. 1-1/8" round bore, 1/4" keyway and 5/16" with set screw. Up to 15 HP (540 RPM) or 22 HP (1000 RPM). Weasler reference number 806-0618. Tisco Parts. Weasler 807-7921 Yoke W/S, 2500, 1-3/8 x 8 x 21 Clamp "NEW"
Retained in Yoke by a Roll Pin. Quick Disconnect Repair Kit. We reserve the right to apply the policy at our discretion. If you make a mistake, I are reasonable and will work with you. We will accept it back. D148023 Implement Yoke Round Bore w/ Keyway & Set Screw 14 1-7/16"
1-7/16" round bore with 3/8" standard keyway and set screw. We will do our best to locate the parts you need, and make every effort to save you money. 20-9154 NEAPCO. Driveline > Driveline Components. Bondioli Pavesi 100 series size 4. BP 650 series size 4CV. Irrigation-Mart 800 SAY-RAIN. Bore ShapeRound. 35mm round bore with 10mm keyway. Round Bore With Pin Hole. 25mm -. 984" (1") bore, 8mm -. 315" (5/16") pin hole. Tisco Parts. Round bore w/keyway (English). 1-1/4" bore, 1/4" (6.350mm) keyway, 3/8"-16 set screw. Bore ShapeRound. Irrigation-Mart 800 SAY-RAIN. 1" bore, 1/4" (6.350mm) keyway, 3/8" - 16 set screw. Irrigation-Mart 800 SAY-RAIN. WYT4-21-2-34 Male tube yoke. Male tube yoke. Weasler reference number 300-7434. Bore ShapeLemon. Alternate numbers AW041315A, A-W041315-A, 658-82330. Round Bore w/Keyway (English). 1-1/4" bore, 1/4" (6.350mm) keyway, 3/8"-16 set screw. Irrigation-Mart 800 SAY-RAIN. Round Bore w/Keyway (English). 1-3/8" bore, 5/16" (7.938mm) keyway, 3/8"-16 set screw. Irrigation-Mart 800 SAY-RAIN. Weasler 806-1418. 1-1/8" round bore, 1/4" keyway and 5/16" with set screw. Up to 22 HP (540 RPM) or 33 HP (1000 RPM). Weasler reference number 806-1418. OEM numbers 14N1845-37, 14N184537GV, 14N1845-37GV, 8061418GV, 806-1418GV. 22MM (.866) IN. X 54MM (2.125)IN. Bore ShapeTri-lobe. Alternate Numbers ABP204016852A, A-BP204016852-A, 658-81030. 1 3/8 -6 spline (Bolt Lock). Male tube yoke. Bore ShapeLemon. Alternate numbers AW040456A, A-W040456-A, 658-82120. Bore ShapeLemon. Alternate numbers AW041318A, A-W041318-A, 658-82320. OEM numbers 35NWY1885, 35NWY1885GV, 7013500GV, 701-3500GV. Up to 40 HP (540 RPM) or 60 HP (1000 RPM). Weasler reference number 701-3500. Irrigation-Mart 800 SAY-RAIN.